Few weeks ago I was feeling lazy and instead of hand-washing my Trangia, I threw it in the dishwasher. Stupid me. If I’d only read the manual I would have know you’re not supposed to wash Trangia — or any other aluminium cookware — in the dishwasher as the detergents cause the aluminium to blacken and discolour. Well my Trangia came out looking totally ruined. Find a large enough pot that fits the Trangia and fill it with enough water to submerge all the parts. Add 3 tablespoons of lemon juice or white vinegar per every litre of water and stir. I used freshly squeezed lemon juice. 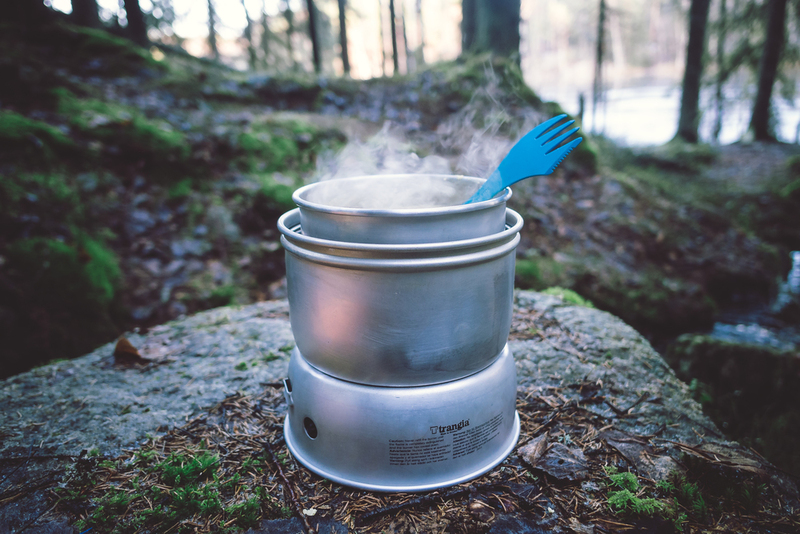 Bring the solution to boil and add the Trangia in separate pieces. Let it boil for at least 10 minutes. I found that for the harder stains it took closer to 15 minutes. Once you see most of the stains disappear, remove the Trangia from boiling water and use steel wool or similar to scrub and remove any remaining stains. Rinse and wash the Trangia thoroughly with clean water and dry with a towel. This was kind of laborious but I was able to rescue my Trangia and remove most if not all of the discolouring and dark spots. Lessons learned: do not wash aluminium cookware in the dishwasher and always read the manual.